The strength of this rally has so far been quite impressive. Many bears are beginning to express great angst; and I even received a few e-mails asking if this could be the start of a new bull. Well, sure, it could be... I don't have a crystal ball or an "inside connection" at the Psychic Friends Network -- but there's still no real indication that this is anything other than a bear market rally, albeit a strong one. I have spent most of the weekend poring over charts until my eyes blurred. Hence, I'm presenting a battery of charts in this article, to allow you to draw your own conclusions. 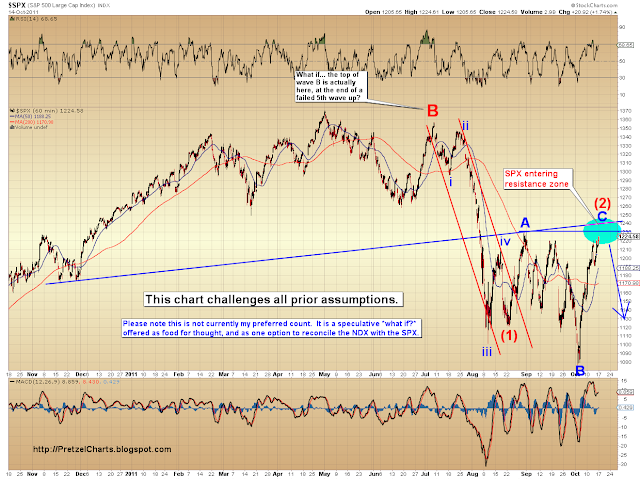 The first chart is an update to the chart I presented about five weeks ago. It shows the closest support/resistance zones in the SPX, as well as some confirming readings from the RSI and MACD which argue in favor of the bear case. It is worth noting that the SPX is right now challenging a major resistance band -- the chart doesn't go back this far, but this current zone has been a bull/bear battleground for the past 14 years. We may or may not bounce around here for a bit, but I would be shocked if this zone doesn't stop this leg of the rally dead by mid-week at the latest. The next chart is the Nasdaq 100 (NDX), updated from my article on Tuesday, when I first posted my target box for this portion of the rally. The NDX gapped into this range on Friday, so we're now right where we "should" be for a reversal in the very near future. 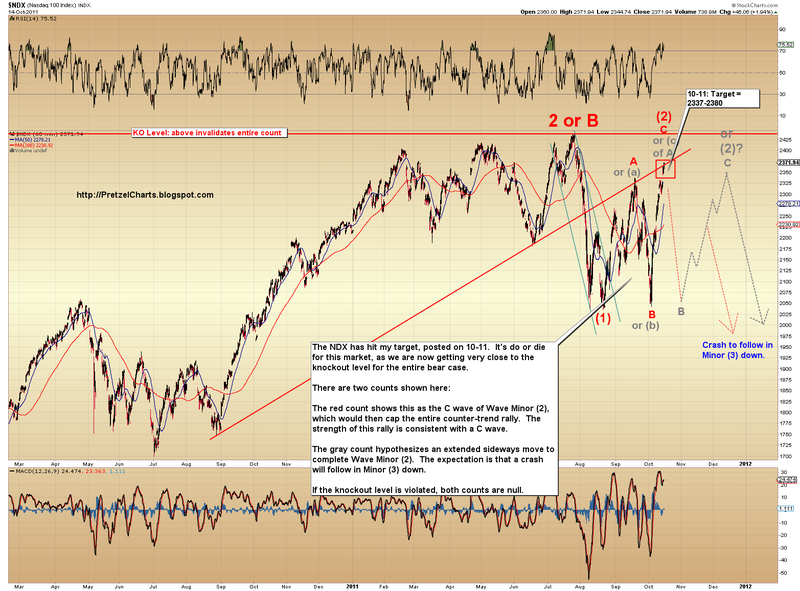 Quite frankly, it's do or die time for the bear case in the NDX. I have two possible counts posted on the chart; and both would be invalidated with trade above the prior high at 2438.44. With Friday's close, the NDX now sits only 66 points away from this level. If this is, indeed, Wave Minor (2)-up, then this close-shave is not unexpected, and could even get closer in the sessions to come. Second waves can retrace up to, but not over, 100% of the prior move and still be within guidelines. The job of a second wave is to give everyone hope that the prior trend is still intact, so the waves usually retrace heavily. The official knockout level for this count is 2438.45. More about this chart below. 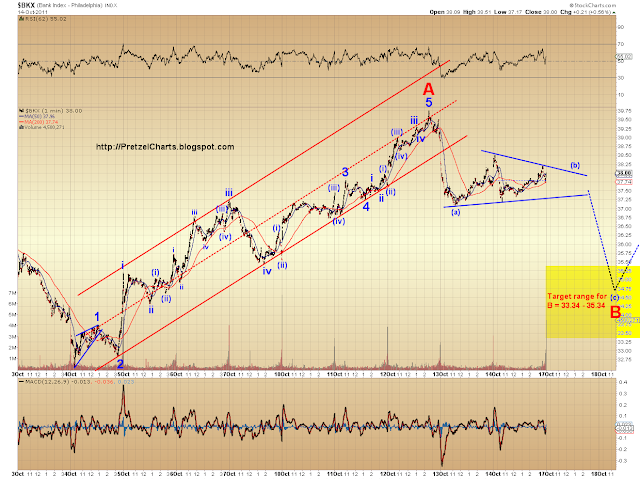 The red labeling on the chart denotes my preferred view that we are in wave C-up of Minor (2)-up. C waves, being third waves, are usually quite powerful -- so the strength of this move is very consistent with that interpretation. Something I've mentioned before is the need to reconcile the fact that the NDX appears close to completing Minor (2), while the SPX is apparently just getting started on Minor (2). The problem is obvious: we're not likely to see the NDX crashing while the SPX rallies, so the two need to be tracking in similar fractals. 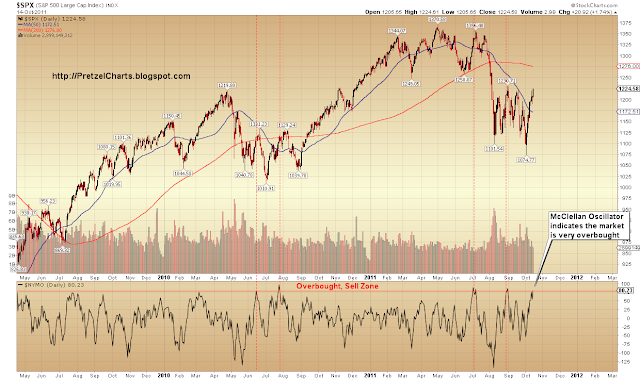 There are several ways to reconcile the indices: one is shown by the gray lines and labels in the NDX chart above. I would now like to present another option. 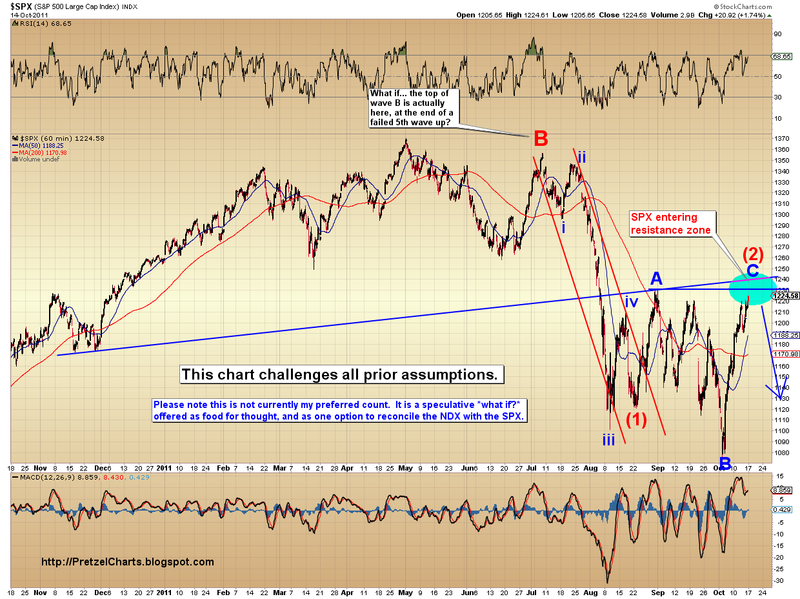 The chart below shows another interpretation of the SPX. It's one I've been kicking around for a while, but I felt the scenario shown was so remote that it wasn't actually worth publishing... until now. The preferred view has been (and still is) that the SPX is in Wave A (of an A-up, B-down, C-up three-leg rally) of Minor (2)-up. This chart explores the idea that this rally is not Wave A, but is, in fact, Wave C-up of Minor (2). 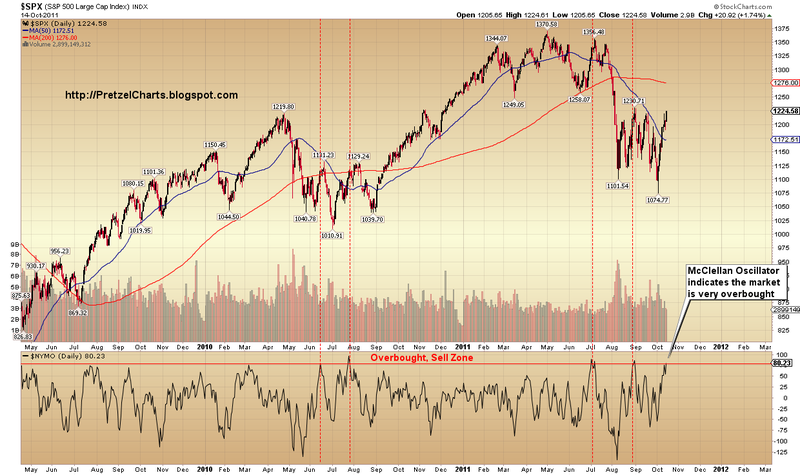 Under this interpretation, this isn't the beginning of a multi-month rally -- it's the end of one. Please note that this is not, as yet, my preferred interpretation. 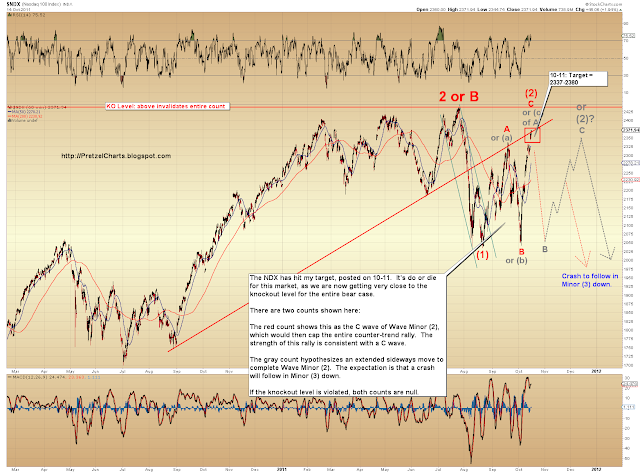 However, the strength of this rally is exceptional for an A-wave; it is actually far more consistent with a C-wave. And, from a psychology standpoint, it seems like the rally ending abruptly would come as a surprise to many traders (which is what the market usually tries to do); so I've decided to present this count as a potential for us to track going forward, at least as long as it continues to remain viable. I do expect that whether this is Wave A of Minor (2) or Wave C of Minor (2), we are almost certainly entering the reversal zone. The blue circle on this chart highlights two lines: a horizontal resistance line, and a rising resistance line. This is also the same area I mentioned with the first chart, and it's a major zone of support/resistance going back 14 years into the past. The Dow is in a similar position. The final chart I'd like to share is a one-minute chart of the Philadelphia Bank Index (BKX). This chart argues that the BKX has already started its correction (the BKX usually leads the other indices). The wave action within the blue triangle is almost certainly corrective, and should ultimately result in lower prices. We might bounce around for a bit before heading south (likely) -- or we could head down immediately on Monday. 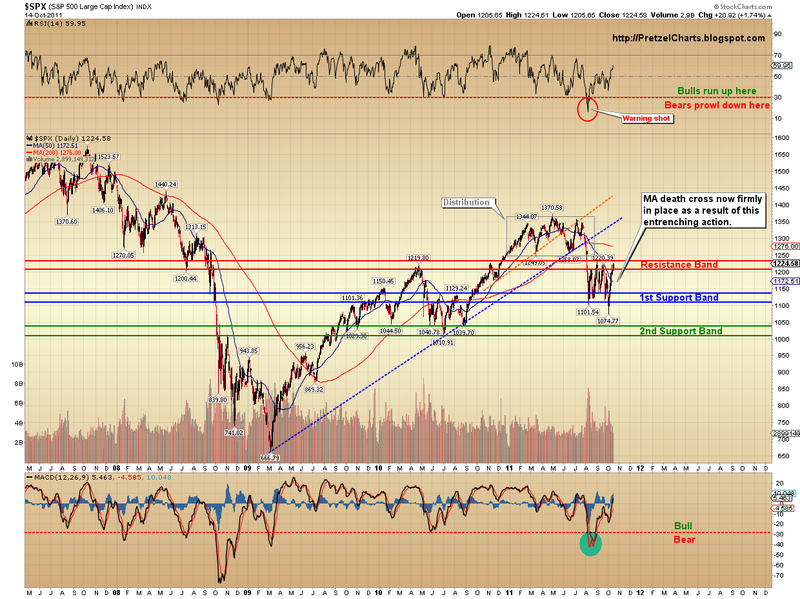 So my expectation this week is that we'll see the indices correcting (or worse). We could still stretch to the upside a little bit more -- but in particular with the NDX, there's not much room left to run. If, by some chance, we do violate the prior high on the NDX, I'm going to have to go back to the drawing board on that index and maybe even start giving the bulls some airtime. I don't anticipate that happening, but it's do or die time over the next few sessions. Should be an exciting week! Good stuff. Thanks for the multiple views/ charts. Count me among the bears feeling a bit stressed by the strength of this rally. Should be an interesting week. Thanks, guys. I'm trying to get another article and charts done on the dollar and gold. The dollar looks very close to completing a 2nd wave down, which means it should stage a very strong 3rd wave rally soon. Hopefully I can get these posted before the market opens. Thierry - if we are completing the second wave up now, basically just take the long term chart and slide everything a couple months into the future. I assume that's what your asking? Tx for the analysis, guess post the option / future expiry last week and the G20 event over the weekend, time to sell the News is ripe, am expecting the correction to start on Monday itself. Sell the news, and, if my long-term dollar chart is correct (latest post), we may actually get some news from the Eurozone that deeply disappoints. You are vindicated sir, for one day :) BKX broke below the triangle as well. Light vol on the COMPQ though, similar to the light vol during the recent rally. and here's wave B-down! interesting to see the bad news from Europe materializing with Steffen Seibert (spokesman for German Chancellor Merkel) saying that there will be now "quick fix" at all.